Shining Force III Scenario 2 was, sadly, never released outside of Japan. However, even though it's in Japanese (and if you don't know the language), the game is still great fun to play due to the fun battles and townsearching elements of the game. Fortunately, there is an online translation for the game, so you can play the game and understand what's happening plot-wise. The scenario 2 translation is available at The Aspinia Translation Team Homepage and Shining Force Central. In scenario 2, you play the role of Medion, the third Prince of the Destonian Empire. Scenario 2 takes place at the same time as scenario 1 and one of the interesting features of the game is that you get to see several of the same events from the first game but from a different perspective. After the Emperor Domaric's kidnapping, Medion is sent to pursue the suspected criminals Synbios and Benetram in search of his father. However, Medion learns that Benetram did not kidnap Domaric at all and he gets deeper involved in the plottings of the fanatical Bulzome Sect - the true kidnappers. During the course of the game, Medion develops a strong friendship with Synbios, but several difficult situations and decisions transpire for the young Prince . . . The battle system is unchanged from scenario 1 but there are a few interesting features to the battles in scenario 2. Firstly, there are several different camera angles in the combat scenes and the graphics in these scenes have been improved. Some battles also have different lighting depending on where the fighting is taking place (for example, one battle takes place in thick fog while another is lit by a warm sunset). There are also new aspects to some battles, like cannons which destroy parts of the combat area and a naval battle between two warships. These effects, although only small changes on scenario 1, add much more dynamism and atmosphere to the battles in scenario 2. If you continue scenario 2 from a scenario 1 save data file, the synchronicity system that links events, items and characters between the games adds a whole new dimension to the game and makes for a fuller gaming experience. Like scenario 1, Shining Force III Scenario 2 is a great RPG which is very fun to play. Although most of the battles are fairly easy, scenario 2 has much more atmosphere to it than scenario 1 did, creating a more enjoyable experience (in my opinion). Shining Force III Scenario 2 is the rarest of the three scenarios to find; its rarity might be attributed to the availability of an online translation (more people would want to play a translated game than an un-translated one). There's usually a few copies available on eBay but if you want it, be prepared to pay a much higher price than you would for scenario 1 or 3. 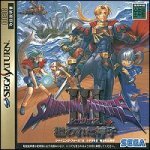 Jumesyn.net's complete walkthrough to the 2nd scenario of Shining Force III. Brief introductions and descriptions of the characters from scenario 2. Reviews of Scenario 2 (as well as other Shining Force III reviews). Translations of elements of scenario 2 (such as the battlecries) alongside other Shining Force III translations.